Much anticipated, the new Angry Birds title doesn't disappoint. It's inventive and compelling. There's a temptation to declare that Angry Birds Space is more of the same. That wouldn't be a bad thing by any means. While there's no doubt that marketing has played a big role in its success, Angry Birds is still one of the best casual gaming experiences out there. It benefits greatly from that "just one more go" mentality and a lot can be achieved in a short amount of time. Angry Birds Space ups the ante in that respect by introducing a sufficient number of new features to ensure that it's not just more of the same, while still retaining the original game's charm. The most prominent change is the addition of gravitational fields. These add a certain amount of randomness and trial and error to the experience, but they do make for a neat quirk. As the birds are out in space, while they dodge planets and asteroids, they can also get sucked into the gravitational pull of a planet thus being propelled around the area. This takes a little practice to truly master. One early stage introduces the concept by ensuring that the only way the bird can reach the pig is by going in the "opposite" direction. The bird will travel a fair distance around the planet, often orbiting once or twice before the turn ends. It might be a little random at times but it is immensely satisfying when something works out. Other new additions come in the form of new birds. The Lazer bird flies like any other bird but a quick tap displays a targeting reticule and sends the bird flying towards the target at great speed. Like the other birds, it's not fool proof but its situational use can make all the difference. Adjustments have been made to a destructive bird type so that it explodes instantly with a tap to the screen. This works well in certain levels that involve a plethora of asteroids, making it plausible to indirectly take out pigs with a rain storm of rocks. Much advertised in trailers is the new Ice Bird that explodes and freezes everything nearby, again providing a twist on the tried and tested formula. Homages to other famous titles such as Mario and Space Invaders pop up courtesy of special Eggsteroid collectibles. There's even a form of boss battle at the end of each Episode. While Rovio promises regular updates, as has been the case with previous Angry Birds games, players keen for more challenge can purchase the Danger Zone, unlocking 30 extremely difficult levels. The majority of players will be content with the basic bundle of 60 levels. It's not quite all amazing, at least not for owners of multiple iOS devices. There's still no sign of Universal support meaning iPhone and iPad users will have to buy each app separately and miss out on consolidated leaderboards. No doubt fans will be willing to accept this however. 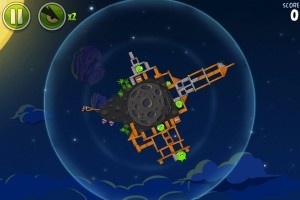 Angry Birds Space is a great new release from the Angry Birds stable. It adds plenty of great new features to entice players in, both old and new alike. Fans in particular will be delighted, even if they will wonder where all their free time has vanished to.